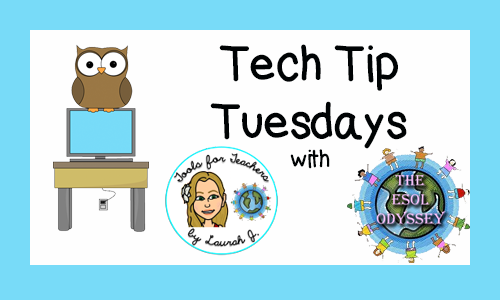 I'm so excited to have a guest blogger for today's Tech Tip Tuesday! Susan is a talented ESL teacher with many years of experience working with ELLs, and today she's bringing you a great tip for meaningful technology integration. This is Susan from The ESL Connection and I am honored to be a guest blogger for The ESOL Odyssey this week. I recently came across a cool app that I am excited to share with you. Haiku Deck works on computers, iPads, and iPhones and lets people create online presentations in the form of slides. Haiku Deck calls the presentations "decks," maybe because the final product is like a deck of cards with each card having an image and simple text on it. You get to decide the design and where the text will appear on the slides, as well as what the background will be for each slide—solid colors or photos from either Haiku Deck’s curated gallery or your own computer. It’s also possible to create charts. This free app has three privacy settings and it is easy to share the decks with others. The end result is similar to an old-fashioned slideshow but Haiku Deck is very much 21st century! The instructions are easy to comprehend and there is little text on the site itself to confuse ELLs when they use Haiku Deck. The amount of text that can be included on each slide is limited, so students at lower proficiency levels won’t feel overwhelmed by writing. Using photos for the backgrounds complements the written text and helps ELLs whose knowledge of English vocabulary is limited to get their ideas across. Students who are not fluent speakers won’t feel nervous or put on the spot because Haiku Deck does not include a speaking component. ELLs can be paired with native English speakers to work together on the writing tasks, which not only supports their writing but also helps ELLs develop their speaking skills since they have to discuss and agree on the images and text they will use in their presentations. Many thanks to Susan for sharing this awesome tech tip and being a fabulous guest blogger. Please check out her blog, The ESL Connection and find The ESL Nexus on TpT!